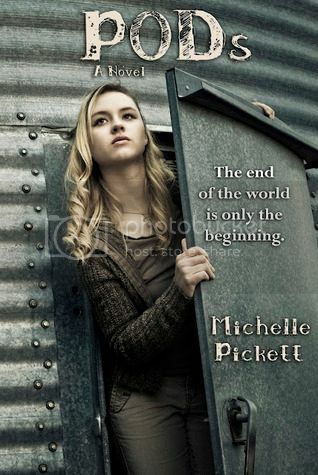 Welcome to The Cover Contessa's blog tour stop for Michelle K. Pickett's book PODs. I had the pleasure of meeting Michelle at BEA this year and let me tell you, you will not meet a funnier, happier, more caring person than her! Go on, ask her all about her giant Reece's Peanut Butter Cup! And she takes the same care with her book! So, read on to see what I thought! A big thank you to Spencer Hill Press for sending me a copy of this book to read and give an honest review. I have been in love with this cover and waiting to read this book for what seems like forever. Receiving this book for free has in no way influenced my opinion or review. First I must say a big thank you for Spencer Hill Press for trusting me with this book. When I first saw the cover, I was totally intrigued. Then I read the blurb (something I do not often do) and I just had to have it. I love a good dystopian for sure and the premise of this one was awesome: virus attacks, people hole up in pods, then they get released and basically restart society. It's a total pull me in for sure. And I love the way things are depicted on the cover. It's totally amazing and just what I might have imagined life in a pod to look like! Evangelina (Eva) is a typical teenage girl. Except she's got one thing she's fighting, fighting to not get the virus which might take her life. So, when she's chosen to go in the POD, we follow her story of how she copes with it and survives. She is smart and funny. She has much insight but at the same time acts like a typical teenager. She's stubborn and wanting to really be able to take care of herself, despite others wanting to do it for her. And she's fiercely loyal, which is a nice aspect to see in a young adult book. David is the love interest in this book. To be honest, at first I wasn't sure he would be. He was a bit introverted and to himself. But we slowly see him pull out of that and watch him fall for Eva. It's a sweet love story. And I love that David is so loving and available for Eva. He treats her like she's the only girl in the world. He is sweet and available and handsome: pretty much the perfect guy. My one draw back is that I really can't picture him. I know he has silver/gray eyes, and brown hair and that he is fairly muscular, but I just could not get a good picture of him in my mind. I did have an issue with David in the middle of the book, which I don't want to get into too much because it will spoil the plot, but he did something that I did not expect with no real explanation and it really didn't seem to fit with his character. As for the secondary characters, I liked their development. It was interesting to see them interact in the very close quarters of the POD. And I think they all helped each other grow for sure. They certainly became a family after spending all the time together. The storyline is interesting. I love the idea of a virus attacking the country; of people having to go into a lottery to be allowed to escape it. And you definitely see a plan for the community as the government's ideas being to pervade the story and take over. Things are not all they seem to those who have been kept "imprisoned" in the PODs while the virus runs it's course through the population. I enjoyed Michelle's writing. I thought it was very well done for a debut author. She certainly showed us her world and her characters. I felt as if I knew what was going on and certainly wanted to know more. A few things that bothered me in this book: the pace. It was fast at first, then kind of slowed for while. I had a hard time getting through the middle of the book. But once the action started, it picked up for me. I did find some repetitive themes: constant zombie attacks, kissing and romance when it really was not appropriate and an overall annoyance with the main character's constant thoughts of her "beau" (I know she missed him but it seemed a little over the top how often she actually thought about him). I also think their relationship was a bit rushed and I didn't get to see their growth as a couple, which I really would have liked to experience. All in all this was a very enjoyable read for me. The story line was really great. I did feel like it could have been tweaked a bit more, like I needed to know more about the government structure and their involvement with the virus and such (this particular aspect of dystopian is often most important to me to help set the pace and plot line). I am certainly interested to see where Pickett takes the story next. Want a chance to win a PODs prize package? Then scroll down and enter the Rafflecopter listed below! Hey, Brooke! I love you, woman. I miss you!! Ask my family--they are so sick of hearing about you. LOL. I have the photo of you, Sherry, D'Vora and me on my desk. I can't wait to see you again and find out what trouble we can get ourselves in...maybe running down some hallways. :) Although, I still admit to nothing. There's no photographic evidence of that happening! Thank you for reading PODs. Big, squishy hugs to you. Awww...I miss you, too! I can't wait for another something for us to get together. It will be such a blast (and I think we can find some great trouble for sure)! Hugs back. And the picture of you, me, D'vora, Sherry and Marie is my cover photo on my FB page! HUGGERS!